Omay Sy in the current film plays Samba, an immigrant from Senegal, who has been living in France for 10 years. He, like many other people who don’t have proper citizenship papers must live in the shadows and are susceptible to arrest and deportation. 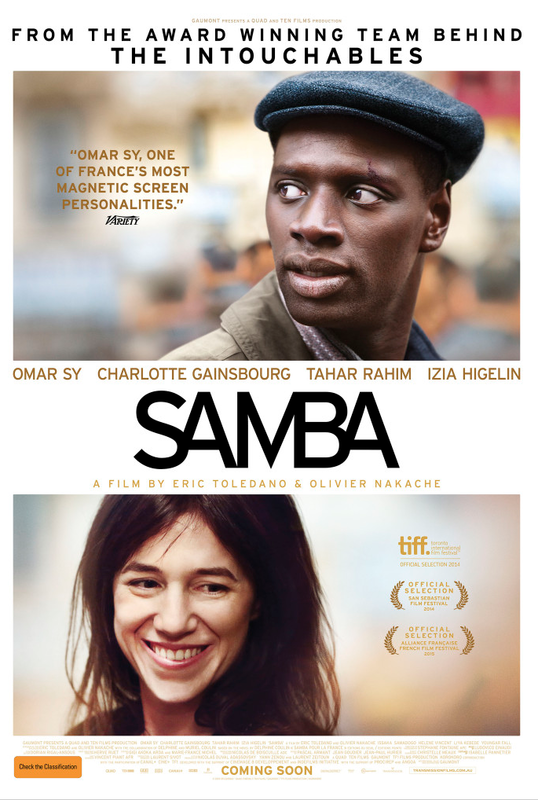 Samba is discovered and temporarily placed in a detention center where he meets Alice (Charlotte Gainsbourg), a young executive who was trying to stabilize her life by doing volunteer work in this facility. Samba is released with the expectation that he will go back to his home country. It is at this point in the film that we see him and other people in similar situations as they struggle to get illegal identification papers, procure jobs ranging from working in restaurants, hotel kitchens, cleaning windows in high-rise buildings or even just doing day labor. We get an insight into the painful life of trying to survive in this environment often while sending money home to their families.